Sandhill Cranes are elegant wetland birds. They tend to group together and may be seen in the hundreds and even thousands together in migrating flight and during winter nesting. 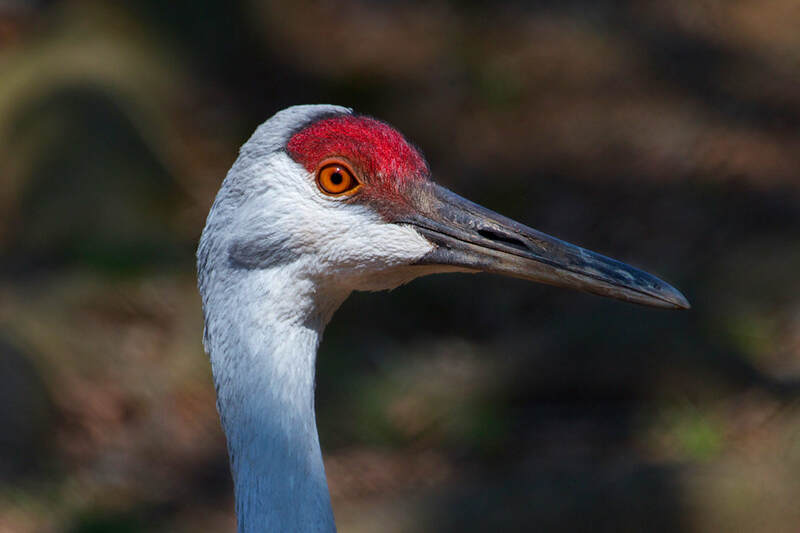 The Sandhill Crane’s unique call is a loud, rolling, trumpeting sound. It is a product of anatomy. They have long windpipes that coil into the sternum. They are also known for their elaborate courtship dances. Courting cranes stretch their wings, pump their heads, bow, and leap into the air in a graceful and energetic dance. DESCRIPTION: Sandhill Cranes are very large, tall birds with a long necks, long legs, and very broad wings. The bulky body tapers into a slender neck. Their heads are small and their bills are straight and longer than their heads. They have gray feathers on their bodies and a red cap of feathers on their heads. Adults have pale-colored faces. All ages of Sandhill Cranes have black legs. They have about a 78-inch wing span. They weigh between seven and ten pounds. Their bodies are approximately 47 inches long. RANGE: While they tend to winter in the southern United States and northern Mexico, they can be found throughout North America during the rest of the year. HABITAT: Sandhill Cranes breed and forage in open prairies, grasslands, and wetlands. Outside of the breeding season, they often roost in deeper water of ponds or lakes. LIFE SPAN: The average life span is about 20 years in the wild.